It’s hard to pin down what progressive music is. For some, it has to include unusual time signatures, tempo changes and vast songs with huge concepts; for others, it concerns blending ideas and pushing the boundaries of what to expect from individual artists. [See our prog podcast episode on this for further details]. Whatever your definition of prog, the Be Prog! My Friend festival has something to fit the bill. From Magma through Opeth to Agent Fresco there is a huge mixture of bands on offer. I was personally excited to see Agent Fresco for the first time and experience Magma who, in some form, will have influenced every other act on the bill. But with so much to take in of new and unfamiliar names, Be Prog! was looking to be an interesting and diverse festival. I was not disappointed. Exxasens are first up, and the crowd is starting to arrive as they play. This is a tough situation for the band as it would be preferable to play to a complete audience, but they handle this well and do not hold back at all. One of the biggest draws with Exxasens is their cosmic atmosphere. To complement this, a video accompaniment plays behind them at various intervals in which an interstellar traveller appears to fall back to earth, which explains why most of their set revolves around the latest album Back To Earth, with only two tracks coming other releases. The brand of spacey post-rock, this band creates manages to captivate the audience even though they are playing within the beautiful setting of Barcelona’s Poble Espanyol and all eyes are on the stage from the outset. Obsidian Kingdom are a hard to define band; ‘progressive’ is really the only category you could put them into, and appropriately. Still, they command the attention of the audience. With their most recent replacement guitarist (named only as Eaten Roll I), the band show that even with recent lineup changes they are able to put on a great performance. As the set progresses so does their sound, with black metal influences creeping in, and there are even noticeable blues and jazz sections. An intriguing show, and thoroughly enjoyed by the majority of the spectators, who’ll no doubt be checking out their latest A Year With No Summer [reviewed here]. Iamthemorning are completely different from anything else on the lineup. To begin with, there are absolutely no guitars on stage – something unusual for a festival based around rock and metal bands. Instead we are treated to a combination of keyboard, strings and percussion with the haunting vocals of Marjana Semkina. Even the layout of this act’s stage show is unusual, with the vocalist remaining side stage as opposed to front-and-centre. The performance was fantastic, and as well executed as their set was, the ultimate takeaway is that it feels very different and shows the versatility of the prog genre. Their album Lighthouse comes highly recommended. Agent Fresco take the stage as the sun starts to set and their draw is huge; the crowd are excited to see one of the most promising acts in the prog scene right now. A mix of both of their albums – Destrier and A Long Time Listening – showcases just how eclectic their influences are with clear references to pop music, math metal and they even manage to throw a bit of djent into the mix from time to time. A few songs in, and vocalist Arnor Arnarson reveals some information which makes the performance even more impressive; he had been in hospital just two days prior with pneumonia. For a vocalist with such a wide range to travel to a completely different climate after having pneumonia, and to perform so fantastically, is an achievement in itself. 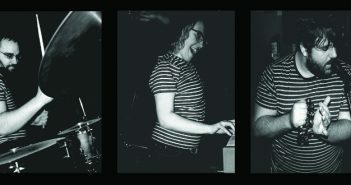 The whole band stay humble throughout, and are engaging and humourous towards the crowd. 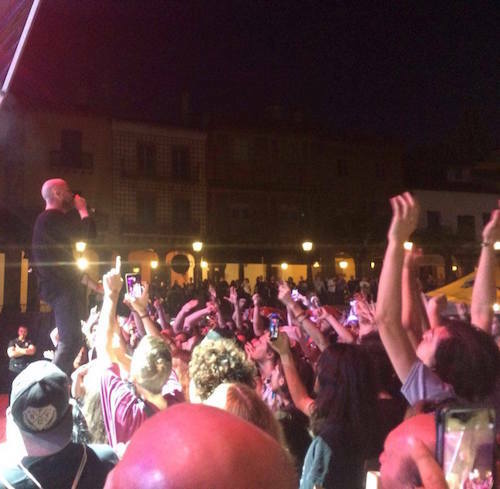 Agent Fresco clearly appreciate the atmosphere, and all eyes are on Arnor as he enters the crowd during their last track ‘The Autumn Red’, and suddenly it feels more like a huge party than a music festival. Our final act of day one hits the stage as darkness fully engulfs the venue, and a sense of excitement fills the air. With The Pineapple Thief’s brand of prog-infused alt-rock mixed with indie rock, they bring another side to the diversity on offer at the festival. They dive into the prog realm providing an interesting mix of styles blended into a unique indie prog sound. An extremely solid set with the whole band performing brilliantly, though due to the intensity of the previous act, it makes for a tough slot. The crowd enjoy the closing act, and it’s clear to see The Pineapple Thief still have a lot to offer to the alt rock and prog scenes alike. Click the tab at the top to read Day Two! First up for the second day are Anneke van Giersbergen’s The Gentle Storm, who launch straight into a full-on metal assault with symphonic and folk elements. There is a huge cheer as they hit the stage, and those who were relaxing in the shade rush to join the main bulk of the audience as people filter in. Once again in a similar fashion to Exxasens yesterday, it is a hard spot on the bill to play, but with sheer energy they provide an entertaining start. Amazing chemistry and a fantastic stage show sets the atmosphere for the rest of the evening ahead and appears to get the crowd warmed up nicely. Anneke van Giersbergen’s delivery showcase the talents she possesses and proves that the female vocalist can put on a great performance as she continues to cement her place in prog history. Plenty of power and purpose in the delivery with each song delivering a different setting/atmosphere. Between The Buried And Me arrive on stage next, and with their eclectic progressive death metal they whip the crowd into a frenzy, with a mosh pit even breaking out on occasion. 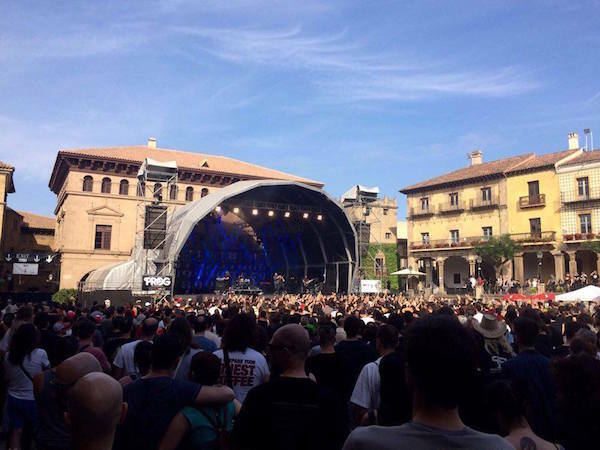 A far cry from the openers, but it doesn’t seem to matter to the people in Barcelona, who make it clear that they embrace all aspects of the progressive genre no matter how extreme and varied. It is worth noting, however, that there is a clear division as to who are familiar with the band’s work and who are experiencing them for the first time, due to the excessive use of unusual time signatures and contrasting sections. There is an astounding variety of styles they implement into their tracks, ranging from dissonant jazzing keyboards to straight-up death metal, and the inclusion of almost comedic moments in the form of circus style keyboard sections. Overall the set is mainly consisted of tracks that the casual fan would be aware of, the bulk of which came from The Parallax II: Future Sequence and their latest offering, Coma Ecliptic. Between The Buried And Me may not appeal to everybody, but the talent on show is undeniable. What more can be said about Magma? They are easily the most unique band at the festival and have more than likely influenced every single other act at this festival. There is even a chant for them before they hit the stage, the first act to get this, and it’s blatant just how important they are to the prog world, despite arguably not translating out of it into mainstream conscience. Intensity is the order of the day, and everything sounds larger than life when performed live. Everything feel so unified for such a complex and unusual amalgamation of sounds, and the dedication Magma put into the world they have created and built throughout their career shines here. For a band approaching their fiftieth year of existence, the execution is impressive. Not everybody in the crowd is familiar with them, but it’s apparent that they are certainly appreciated. 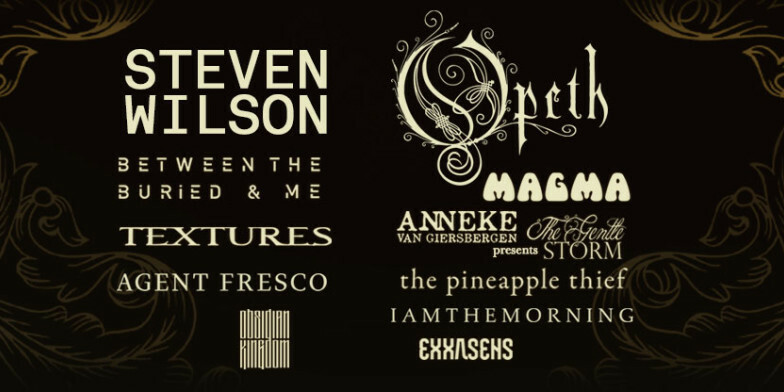 Opeth’s second appearance at Be Prog! My Friend festival is certainly a welcome one. As usual Mikael Åkerfeldt is comedic and brings a jovial feel to their dark set, a strange dynamic but one that has served Opeth well throughout the years. There is a level of crowd participation that surpasses every other set for the whole festival; the crowd not only sing along with every song but the music itself in many instances. 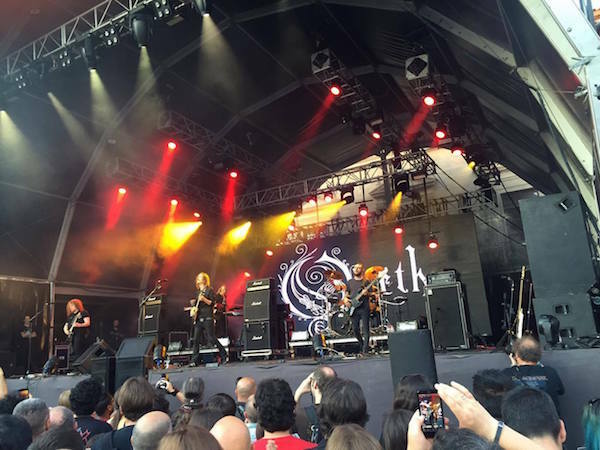 It is clear Opeth enjoy the Spanish crowd and thoroughly entertain throughout their 2-hour set. Shameless plugs for their upcoming album Sorceress come in the form of gags as Akerfeldt teases he will play a new track only to play a single chord. Getting to the full songs, Opeth have a huge back catalogue to choose from with 11 releases in the last 26 years. They use everything at their disposal and play songs from 9 different albums. Impressively, there doesn’t seem to be a song that the audience are unfamiliar with. The variation in songs is impressive as they switch between all-out death metal, hauntingly soft arrangements and 70’s inspired prog with ease. 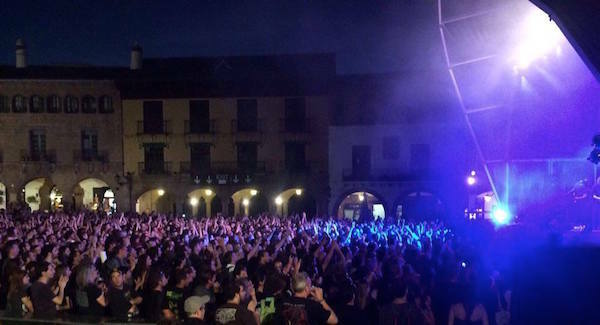 Barcelona was noticeably pleased with old favourites such as ‘Leper Affinity’ from Blackwater Park, ‘The Grand Conjuration’ from Ghost Reveries and Deliverance’s title track. As the set rolls on Mikael jests about the following act – Steven Wilson – but also compliments him and tries his best to get the crowd excited for the appearance of his long term friend. The night wears on but nobody appears to be lethargic, and in fact the atmosphere appears to intensify as they wait for Mr. Steven Wilson. He’s a big draw and one that appeals to the vast majority of prog fans; it’s telling that there are more Steven Wilson/Porcupine Tree shirts than any other artist’s. As the the stage is prepared and the lights dim, the venue looks even more beautiful as the closing act prepare to grace the stage. As he launches into ‘First Regret’ the crowd join in and a huge chorus of voices erupts, bringing with it an undeniable sense of unity. Wilson picks from the vast catalogue at his disposal, but the set contains a lot of the Hand. Cannot. Erase. album – it takes up around half of the set on its own. Despite his own vast catalogue of solo releases, he manages to slip in a few Porcupine Tree songs (‘Lazarus’, ‘Don’t Hate Me’ and main set closer ‘Sleep Together’), which goes down a storm. 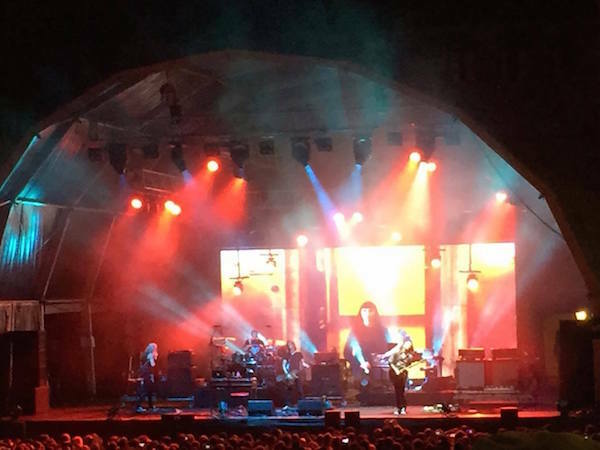 The crowd demands an encore and Steven Wilson and his band happily oblige with ‘The Sound Of Muzak’ (another Porcupine Tree classic), ending on the haunting ‘The Raven That Refused To Sing’. Steven is charmingly British throughout and a sterling example of what not only the festival, but the prog genre itself is all about. It is a shame that there was no collaboration of Steven Wilson and Mikael Åkerfeldt at the same venue, but nothing felt it was ‘missing’ from either’s set. It’s late when post-headliners Textures hit the stage; in fact it’s nearly 2am, and they have more than an hour’s set ahead of them. Understandably some of the crowd has dispersed, but not as many as you would maybe imagine for the time of night. There is a huge contrast in the audience with the majority still going strong, but noticeable sections of the crowd relaxing as they enjoy the closing act. Textures focus heavily on their latest release Phenotype, [reviewed here], but also include old favourites such as ‘Laments of an Icarus’ during their encore and ‘Regenesis’ during their main set, all the while maintaining the energy despite the lateness of the sets ending (3am). A perfect closing to an epic festival, with as many twist and turns in the lineup as you would expect in a prog song. 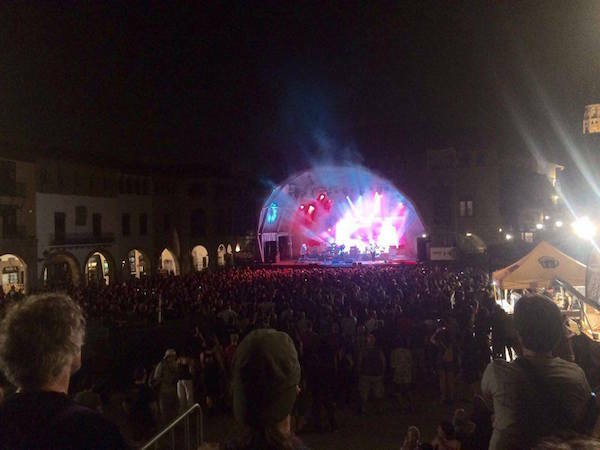 The genre is thriving and the festival will no doubt continue to gain traction. Highly recommended for a couple of days of prog in the sun. 1. Anneke van Giersbergen’s history stretches back to pioneering doom metal band The Gathering, and she also has a long-standing collaboration with Arjen Lucassen, which includes Ayreon and The Gentle Storm, and with Devin Townsend on the Devin Townsend Project. Photo credit to Nick Berry and Laura Frazer. Many thanks to Simon for the opportunity.